Pilar de la Horadada holidays take you to a charming town at the southern end of Spain's Costa Blanca. Holidays to Pilar de la Horadada can be taken at any time of year as the summers are long and hot and the winters are mild. April to October are the busiest months with temperatures reaching the low thirties at the height of the season. Holidays in Pilar de la Horadada have wide appeal with families, couples of all ages and golfers flocking to its shores. 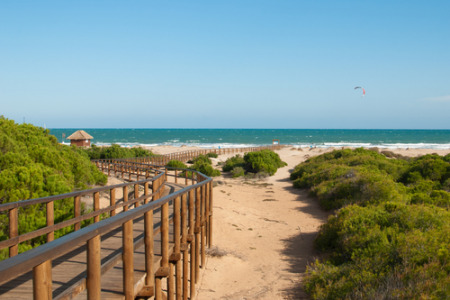 With three miles of sun-bleached sandy beaches, as well as many small coves, it comes as no surprise that our cheap Pilar de la Horadada holidays are snapped up by families. Pilar de la Horadada is a very attractive town with an historic centre and beautiful squares and gardens. Shopping here is good, restaurants provide for all palates and there are evening venues to suit all moods and tastes. Since accommodation is good, our low cost Pilar de la Horadada holidays are considered excellent value, especially since our commitment to quality and service is never compromised. With a variety of water sports, a choice of golf courses and numerous recreational facilities and sightseeing opportunities, our bargain Pilar de la Horadada holidays can be as relaxed or as energetic as you wish. The choice is yours. For further information, and to view our best Pilar de la Horadada holiday offers, please use the search facility.